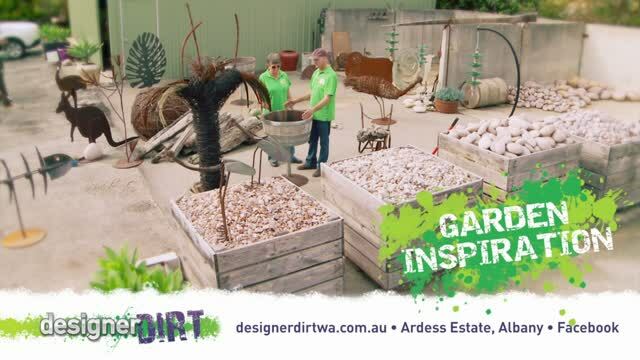 Designer Dirt is owned by Ian and Jane Michael, who have over twenty years experience working in fertiliser, materials handling and landscaping products in the Albany and Great Southern region. Ian hails from Mingenew and the Gascoyne and has a wealth of rural knowledge. After years of practical experience in farming, transport and fertiliser, he is enjoying utilising his talents in a more creative manner. His commissioned recycled metal artwork is found throughout the state, from Onslow Airport to Perth and Denmark. Originally from Kojonup, Jane's Business Degree from Curtin plus her experience in the fertiliser industry helped them set up Designer Dirt in 2012. She loves being involved in the day to day workings of the business, promoting local artists and volunteering on local committees, such as ArtSouthWA. Both enjoy living in Albany and love the amazing coastline that surrounds the region.